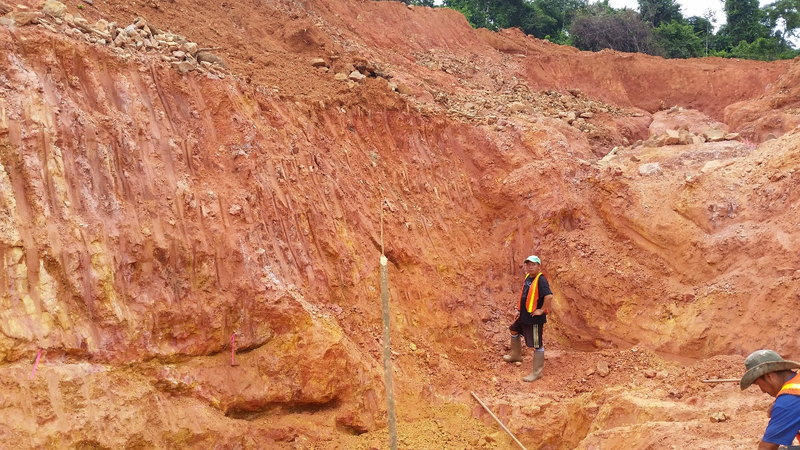 May 9, 2018 / TheNewswire / Vancouver, Canada - Guyana Goldstrike Inc. (the "Company" or "Guyana Goldstrike") (TSXV: GYA, OTC: GYNAF, FSE:1ZT) is pleased to report that the Company's geological team has completed preliminary trenching, mapping and sampling at the Paunch area on its Marudi Gold Project ("Marudi" or the "Property") located in the Guiana Gold Belt, Guyana, South America. Peter Berdusco, President and CEO of the Company states "Our mandate via the recent investment by Zijin's Global and Midas Exploration Funds is to explore Marudi for additional hard rock ounces to add to the Company's existing resources. To this effort, we have initially identified seven areas of geological interest for the discovery of gold mineralization. Our first area of focus, Paunch, is located only 1 km north of the Marudi camp and is accessible by road. We anticipate assay results from Paunch very shortly." Assay results will be announced when analyses have been received and maps are completed. The map below contains the locations of trenching performed in 2008 and 2011 by a prior operator. The location of Paunch has been added to the top right of the map. The Marudi camp and associated buildings are situated between the two previous trenching programs and to the south of Paunch. Paunch is roughly 1.5 kilometres north of the Mazoa Hill mineral resource and 1 kilometre east of the Marudi North zone. A successful trenching program at Paunch may open mineralization to the north east of the camp and potentially merit further exploration work. Locke Goldsmith P. Eng. P. Geo VP of Exploration states "Exploration by trenching and sampling is an important and cost-effective method for the identification of hard rock drill targets for future diamond drilling. The Paunch area is the first announcement of a robust trenching program that is now underway. We look forward to trenching the other areas of interest and further defining our drill targets."